There are currently 241 user submitted reviews for this restaurant. Been to Angelis probably fifty times. Food was excellent as always. Service was very poor. Waiter basically didn't do anything except bring the food and collect the money. Did not ask how meal was, was going to come back with drinks an did not. I had to go up and ask the girl seating people for drinks. We asked for a to go box and he did not bring it. I asked another waiter and he got the box. Very poor which is unusual and I hope it doesn't happen again. I have lived in Myrtle Beach for 14 yrs. and visited this restaurant twice. Both times the food was terrible. The seafood lasagne (the special tonight) was overly salty, very thick sauce. when they brought to the table it was warm on the outside and cold in the middle. I would waste my money here. Supper was delicious chicken Alfredo.try to eat here at least 3 times a year when come down to the beach. Never had a bad plate and eat same thing every time. Wow, most of these reviews seem to be from out of state visitors. And a lot from the area of the country where Angelo is from. In my experience with Angelo's there is good reason. Being a local, and, shall we say an ethnic with ethics or Italian by birth, I know traditional food when I taste it. I eat at Angelo's regularly and everything he serves is absolutely top notch. The steaks are.. omg I am drooling .. the best you can find anywhere. The pasta and sauces are prepared to perfection and all the supporting foods, salads, vegetables, deserts are traditionally prepared also. I guess this is to be expected since Angelo is from Steubenville Ohio. Dean Martin's hometown (Real name Dino Paul Crocetti). Protected from vampires because of all the garlic, it was a great place to grow up and learn everything about the old country. Thanks Angelo! Keep up the great work. Every time we go to Myrtle Beach my staff gets a real steak dinner on me. Over and over again they tell me the steaks are 'absolutely the best on the east coast'. Renolds Co.
Angelo's is definitely a place we will hit every year when we go to Myrtle Beach 2nd time eating there.Steaks are amazing, we actually arrived late and were the last customers in. Still was treated nice, didn't feel rushed and the food and service was still great considering the time of evening. My boyfriend and I both have been coming to Angelo's for 25+ years. We love the food, the service, and the way the buffet is set up. You go through the line and tell the server who is behind the glass partition what you want and they fill your plate accordingly. Very sanitary. The food is fresh, authentic Italian, and rivals any other Italian restaurant on the Strand. Recently we've had the opportunity to try the Sunday Brunch a couple of times and the breakfast buffet, which operates in the same sanitary manner as the Italian lunch and dinner buffet, is the best we've ever had on the beach for any price. We look forward to visiting Angelo's again soon. Ordered Filet Minion Steak. Very disappointed. It was a thin cut, not your typical robust Filet in anyway. Very bland not much flavor. I ordered it to be cooked medium. It came rare. The vegetables were also under cooked. Not a good value for the money. I will not go to this restaurant in the future. We had a party of 8 that decided to come here for the breakfast buffet on Sunday, February 16th 2014. Buffet starts at 11 am. We arrived and seated by 11:40. We go to the buffet line and....no bacon, 1 pc of sausage, no eggs, no cinnamon rolls...now mind you there wasn't even a dozen guests already there. We waited and waited for food to be brought out. The eggs finally came out and were brown looking (scrambled) and would only be 2 servings, then they brought a small container of bacon...omg...it looked like they put it in the pan and warmed it up it was so limp. Needless to say, by 12:15 we left. We will not be back! I would think if it was a buffet, you would be prepared and have extra food made up accordingly! It was a cold night. Maybe the coldest of the year but it was nice inside. Angelo and his staff prepare the best Italian food and the greatest steaks in all the carolinas. Go there. Try it. Get something simple at first and you will be totally impressed. Always going back when in MB. It was okay. We went for our anniversary dinner in December. We were seated immediately. The server was wonderful, attentive and knowledgable about the food. I ordered the buffet which was mediocre. My husband ordered a steak, you had to pay $5 extra for mushrooms and onions, which is a little pricey. We would rather Thornys or Carolina Roadhouse. The new location is amazing and beautiful!! I have been coming to angelos every year I visit MB! The food is superb!!!!!!! I visited Angelo's for the first time this summer. I've gone back to MB two additional times, and both times I HAD to go back. Some say that the marsala sauce was too sweet... I beg to differ. Theirs is different from others, and that made it wonderful....could've just had fettucini smothered in it. I even asked if they could sell it since I'm not from MB...but Angelo wants folks to continue coming back...I'm sold...each time I visit, I'll be visiting Angelo's. Also, the steaks were so tender and flavorful that they didn't need any type of steak sauce. My mouth is watering just thinking about it....can't wait to get back!!! We have been coming to Myrtle Beach three times a year for the past eight years. Our children introduced us to Angelo's on our very first visit The first year I ordered the buffet, two ordered Chicken and three others the steak. The rolls and salad are superb. Since then, four out of six order the steak. The ambiance, service and excellent quality of food always brings us back. Steaks are the best in MB period! We eat here every year and this year it happened to be my birthday so of course I chose Angelo's. The salad and garlic rolls are to die for! Service was fantastic, you will not be disappointed. I would however recommend the steak and not the Italian buffet. Ate there on 6/23/13, cannot wait to go back next year! Ordered Steak and Potatoes that were good but average. The buffet food was OK but with all the positive reviews I expected better. With all the restaurants in the Myrtle Beach area this is by far not my favorite. The staff was friendly but the dining experience was not. It was great... we had the early bird buffet and 6 oz steaks. The service was AWESOME!!! The food was great. We did not wait for our steaks at all. The salad was great and the dinner rolls were great! We would go back again in a heart beat! We are a group of golfers from PA and Ohio. We read the reviews here and decided that we needed to try out Angelo's. It was one of the highlights of our trip. We also found out that Angelo is from our part of the country and knows what Italian food is all about. Thanks! We found this place about 6 or 7 years ago on Valentines and have been coming back every time we came to MB. We moved here 2 years ago now this place is a regular for us. No better food anywhere in the world. Best Steak I have ever had. Service was excellent. We were told a 20 minute wait when we arrived, but it couldn't have been more than 10. Somewhat pricey, but the food was definitely worth it. I wish their parking lot wrapped all the way around the building. Searching for a spot can be an adventure, because it's also not the biggest parking lot. We went to Angelo's after my son's baseball tournament. The place was packed but we were seated quickly. I loved the pictures in the bar of Steubenville, Ohio. This is my home town as well as the owners. My wife, son, and two daughters were seated for dinner. Our waitress was very nice and knowledgeable. We ordered appetizers and a bottle of Chardonnay for my wife and I. I ordered the large rib eye, my daughter the split filet Marsala, regular filets for the rest of the family. For the most part the food was good but my rib eye was so tough it could not be cut. The waitress took it to the manager who agreed and told me this happens in 1/100 steaks. They took it off our meal. After reading all the SUPERB reviews, my family deciced to try this restaurant out. I was VERY disappointed. The buffet was boring and average. The steaks certainly were NOT stellar, I ordered a medium cooked ribeye, I got "well". The service was great, but the food was " below average" for the price!! Sorry to be the spoil sport, but it just wasn't all that! If u love steak this is the place to go. Everything else was ok. Will go back for the steak! Server was awesome! We own a restaurant in the upstate and Angelo's is hands down our favorite place to eat at the beach! Great quality food and wonderful service. They know what they are doing. 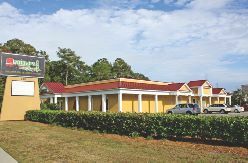 Not only is it a great steakhouse, but their pasta dishes are some of the best tasting you can find on the Grand Strand. It does get crowded and there may be a line -but as you can see - there is a reason for that. Read a number of good reviews and our group of 6 decided to give it a try. Most of the review talked about the great steaks and they were. However, two of our group had pasta and wished they had gotten steaks. The server was a little out of sync. I would definately recommend the steaks. Eat there EVERY TIME I travel to the beach. The best steaks in the galaxy, and try to be there when the magician is performing. Awesome! Another golf trip to Myrtle Beach in october has come and gone. also another excellent meal at angelos. We had a few guys from Pittsburgh with us this past year and they raved about their steaks. They are returning this year and can not wait for golf and a trip ro Angelos. I has 14 ounce ribeye that was excellent. Great service and staff. Will be looking forward to going to the new building. Next time you are in Myrtle Beach try this place, you wont go wrong. golfer from Gastonia N.C. The steak is great. My waiter, Mike S., was wonderful. The food here is wonderful. The sizzling steak is one of the best steaks my husband has ever had. The chicken alfredo was delish too. We have been back to MB since our first trip and ate here again. Great place!! Had wonderful food! most amazing pasta with tuna! gabe was our waiter he was wonderful! will go back for sure! . Had to write a review for this place. I ordered the big 24 oz steak it was great. Very juicy and seasoned well it almost melted in your mouth. Good friendly staff. Will definitely be going back. We usually get steak here. It is excellent. The mashed potatoes are the best I have ever eaten. We live here so we know the best restaurants! The steak was great! We heard about their Magician Michael Bairefoot and had to go check him out. Man was he funny and his magic is the best I have ever seen. I mean my group was golfers and he had them in the plam of his hand. Make sure you ask for him! Great food & selection. We are from Steubenville, Oh and are familiar with some of the family, especially those running Capri's Sandwich Shop on Stoney Hollow. We would be really excited to see a similar Sausage & Meatball sandwich shop open in this area. WOULD THAT BE POSSIBLE?? The steaks are to die for. We come back for the steaks year after year. The buffet is great and delicious, The steaks are cooked to perfection. Me and my friends have not missed a Friday in years! We started here eating the buffet as a group of guys golfing but for the last 20 years we have eaten here 2-3 times the week we are golfing and they are excellent steaks. We have never had a bad meal but miss some of the great wait staff that have moved on! We were seated immediately. Food was fantastic! We will definitely eat here again! It's True The Best Steaks in The Universe.We are yearly Guest. My friends told me about this place so we went to try it ourselves. It was my favorite place to eat in Myrtle. I'm gonna eat next time we are at the beach. Great family environment. Highly recommend. Absolutely the best steak in the Carolina's!! My husband and I went there after much persuasion from my parents, and for once the nailed it. He and I both ordered the 8oz. filet. I always drown my steak in sauce, but after our server begged me to try it first, I was in heaven. We are going back next week for our anniversary. This was my first time to visit Angelo's and I cant give this place enough stars, food was excellent, I got the steak and it was the best steak I have eaten in a long long time. This was only my second time in Myrtle Beach and you can bet next time I'm in town I WILL be eating at Angelo's again! Not bad, just an average meal. What disappointed me was the fact that my $17.95 steak didn't come on a sizzling platter. Apparently you have to spend more than that. The waiter said I should have told him I wanted it served that way. last year was our first experience at Angelo's. we have eaten there several times since, every time our meal has been outstanding. the steaks are cooked perfect, salad was a gracious plenty and the sauteed onion's and mushrooms are a delicious side. the staff are very nice and do a great job as well we will definitely keep this place a beach tradition! We are in Myrtle Beach for five nights. After several recommendations, we decided on Angelo's. After our phenomenal dinner last night, we will be going back again. We started with the shrimp cocktail and lobster medallion appetizers, which were fantastic. Our main courses were the filets which were cooked perfectly, and melted in our mouths. Everything was delicious, including the Tiramisu!!!!! Our waiter, Dink, was outstanding and a lot of fun!!! He answered all our questions, and was very accommodating!!! It was a very pleasurable dining experience, and we will recommend Angelo's to EVERYONE back home who plans to vacation in Myrtle Beach!!! It is a can't miss place for a terrific meal and wonderful service!!!!! Thank you all!!!!!! Went for early bird special...great value, food was fresh and obviously hand made. The buffet is small but the food was delicious, especially tortlini and Italian sausage. Service was attentive and professional thanks to Josh. Going back tomorrow to try the steak! This restaurant was a quick find on our last beach trip in 2010. We wanted something besides the normal fish, breakfast food or fast food. We were SO amazed at the service and the food. This is now a must do each time we have gone to the beach. They dont rush you, you take your time and eat, the staff is amazingly nice and with the variety, you definitely get your moneys worth. Have been staying in no.mb for 10 yrs,every Aug. we have always made Angelo's a must stop at least once.the veal fran. Is to kill for,the best i've ever had.most of the family goes for the steaks,and they rave about them. We are from new jersey,. My wife and I ate last summer while visiting MB. I loved the steak. Other than carolina roadhouse its the best i've had on the strand. Salad and bread were also good. My wife had the itallion buffet which thought was ok but not great. Every trip to Myrtle Beach my wife and I have to eat at Angelo's.It is the best steaks in the world.We have never had a bad time there.Looking foward to our next trip there,it will not be long.Angelo's here we come! We went to Angelo's last night, my wife had the Rib Eye...Tasty but very chewy. I had the buffet, the meat raviloli and pizza were very good. The rest of the buffet including the meatballs and sausage and the meat sauce were just tasteless. This is the best steak house in Myrtle Beach.. The italian food is also good but the steaks are amazing. The service is also top notch do not pass this restaurant up while in Myrtle Beach this will be your best dining experience and the prices are right.... The best dish is the Steak Marsala to die for!! Picked this restaurant based on reviews. Food was as good as advertised. Atmosphere was not what I expected. Long wait to be seated. How lucky were we to have randomly picked Angelo's for our dinner last night! Our waiter, Brett, was courteous, efficient, attentive, as well as very knowledgable regarding your selections. My 8oz Filet was the 'best' I've ever had and my husband had no problem with his 10oz strip steak claiming to be very tender and spiced to perfection.. Brett was alone serving in the room to the right of the bar and treated every table with a smile. BRETT IS A KEEPER!!! Continued success for years to come. My family and I have eaten at about 75% of the restaurants in MB. When we have the taste for a steak, our #1 stop is Angelo's. They are mouth watering!!!! Business travelers look no further. Angelo's steak house is awesome. Excellent steaks! Great salad! Fantastic green beans! Tasty baked potato! Fair prices. I will definitely revisit this place. Some day, I might even try the pasta! Na, just kidding, I'm sticking with the aged rib eye! In Myrtle Beach for anniversary and Just left dinner at Angelo's which was amazing just as the reviews on here had described. Best steak I have ever had dining out. Dink was great, very friendly and accommodating. Everyone should eat here while in Myrtle Beach! The last time I was in Myrtle Beach was at least 8 years ago on a golfing trip with my buddies. One of the things I remembered from the trip was the great steaks and the fact they were served still sizzling on the platter. I couln't remember the name of the restaurant and finally found Angelo's after some internet research. I am very happy to have found Angelo's again as the meal my wife and I have just enjoyed was awesome. The steak still sizzles and the accompaniments are wonderful. Nice touch that salad and rolls were served before our order was even taken. The salad was presented in a large bowl with individual salad plates for us to serve ourselves. The service is efficient and friendly. I will make it a point to remember Angelo's for my next trip to MB--hopefully sooner than 8 years. We ate twice over Thanksgiving and had great steaks both times. Nobody in our party liked the salad dressing. The bar was slow and the drinks were below average when they finally arrived. We went to dinner around 5:00 and did not have to wait either night. When we left there was a long line so go early. Go to Angelos every time we visit Myrtle Beach and have never been disappointed. Was there in September this year and the food was awesome. Had ribeye steak and it was, as everyone says, the best ever. Other members of our party had the buffet and they loved it. Going back in November for at least ten days this time and can't say how many times we will end up at Angelos but you can bet it will be more than once. Can't get enough of that great tasting steak. Why are you going somewhere else? Think again. Save your "special dinner" for Angelos. For the last five years we make it a first priority! No lie-it is before the ocean, before the amusement park....it is a must do before anything else. Filet Marsala outstanding...regular filet the most mouth watering melt in your mouth steak you will ever eat in your life I don't care where you have eaten....this beats it...it doesn't get any yummier than this! Entire staff from hostesses,bartenders,waitstaff to owner Angelo himself are the people you want to spend your time with and give your hard earned money to.......no complaints ever! My late father & his golfing buddies had made Angelos the yearly tradition when visiting from N.Y. for the last 30 years. They knew a good thing & stuck with it-now my family will carry on that tradition for the next 30 years. Thanks Angelo....God Bless you for hanging in there, doing the hard work & hiring the best that has paid off in literally the best thing to look forward to at Myrtle Beach. Go hungry....order any steak....don't sweat the few extra bucks you may have to spend.....don't get mad on your way home when you wish you would have made time to go once more & now you must wait until your next visit to Myrtle to have an experience you just can't stop thinking about. Soooooooooooooo Scrumptious! This place has excellent steaks! I can't say that enough! We LOVED it. They were $20 a piece, but totally worth it. We got the blue cheese garlic butter to go with them and it was out of this world. The only things I had a problem with is that we were seated right on top of the other tables. There was no privacy or intimacy for it to be such an expensive restaurant. They also had a buffet, which we got for our daughter. The food was hot and fresh. If you're wanting to go to pig out, you'll probably get embarrassed. There is a lady that serves you the items off the buffet, which some people may find uncomfortable. Overall, I would eat here every night of the week. It was fantastic except for the pricing...although worth every penny. This was our second time to Angelo's because we always give a restaurant at least 2 tries. Both times my wife and I came to the same conclusion. The steaks (we had the filet and NY Strip) are good but not exceptional. The balance of the meal was poor at best. My wife had escargot and I had the she-crab soup. They should have been ashamed to serve the escargot - it was awful (we've had it many times) and the soup was luke-warm for one and not very tasty. They didn't serve a vegetable with the NY Strip (seems cheap to me) although my wife was served string beans with her filet ( I don't understand ). The salad was below par for this type of restaurant and the bread that they served, I can't describe. The service was fair at best. This is our 2nd poor experience there and we will not return (we are locals). Based on reviews my family and I paid a visit to Angelo's..I could not agree more. Place was great. Steaks were nice and tender, the side dishes were good.Dink,our waiter could not have been more helpfull.Great value for the price.We will definetly be going back. Our family and neighborhood friend started coming to your place 22 years ago. Still the only "required" resturant we go to yearly. Outstanding buffet, steak, salad and garlic rolls. Bringing grandkids down now and it's still the family tradition that can't be broken. Simply the best! We were advised by the locals to try this Italian restaurant for their steaks rather than just the Italian cuisine. Boy, the locals know what they are talking about! We had a ribeye and filet mignon that were both huge and the tenderest of any establishment we've been. Highly recommend this place for the steaks. If we had more time, we would have tried their Italian food, but we did get the spaghetti as a side and it was great too. If you love steak, go here. No need for salt/sauce either! Let's make it easy for everyone! BEST STEAK I HAVE HAD EVER!!!!! Read the reviews and decided to try and man am I glad I did! Got the 24 ounce Rib Eye, had to take a picture of this monster because no one back home would believe it! This huge steak came out on a sizzling hot platter smoking hot! Seasoned to perfection cooked perfectly it was wonderful! Everyone in my party got steak and everyone was blown away by the quality! As I was enjoying this delious steak I was watching other meals come out, let me say everyone looked great!!!! Can't forget our lovely waitriss Roseanne complimented the perfect meal! She was wonderful even took pictures of our group and kept the drinks refilled and was there constantly checking on us! Give her 5 stars plus plus!!!! Did I mention the desserts had the Kentucky Pie and also one other in our group had the cheese cake, both were the best!!! I don't often give a waitriss a 20% tip but Roseanne made us feel like family and the meal was 5 star all the way so she got the 20% tip!! We come to Myrtle every year and Angelo's will be a must stop at least twice every trip! Who would of thought you would get the BEST STEAK at an Italian place but we sure did! The reviews on line got me here the first time but the food and service will keep me coming back! I am just glad to see this place is still there i haven't been there is years but my family and I have to eat there everytime we visit so its a relief to know they are still there. Three of us ate at Angelo's the week of July 11. We found the food to be just average. My husband and son had the 14 ounce ribeye and both said they were nothing special and not worth the price. They both said they had better steaks at other places in Myrtle Beach. I had the chicken marsala and did not care for it that much. We will not be going back to Angelos again. Outstanding steaks. We look forward to coming to Angelo's each time we are in Myrtle Beach. A friend recommended this place several years ago and our entire family enjoy the food and atmosphere. STEAKS ARE OUT OF THIS WORLD. Our kids always ask when can we go back to myrtle to Angelos. Very well worth a trip for us. We recommend trying Angelos and see for yourself. We have eaten at Angelo's for 10 years now!! A friend recommended it our first trip to Myrtle Beach and we fell in love!!! The food adn atmosphere in the restuarant are top level. Best steak I have ever eaten, and our now 3 year old who doesn't eat anything, LOVES the spaghetti!! Oh and the salad and rolls are to die for! There is nothing about the experience you have here they could improve upon!! Best restaurant in all of Myrtle Beach... hands down!!! This place should be called a steak house, not an italian restaurant. It's without a doubt an italian restaurant. I started coming here two years ago, honestly going in the first place because of the reviews here on this Web site. It is definitely a destination now every year. I'm 37 years old and without question these are the best steaks I've ever had. I always get the 24 oz ribeye. It's tender and I order it medium rare each time and each time I've been here they've been on the mark, getting it just right each time. The service is excellent and there's a diverse menu if you do want to eat italian or chicken. There's only one Angelo's, but if they ever expanded and put another location in N. Myrtle Beach, it would be a huge success. Best steaks on the Grand Strand here. Bar none. Angelos is the first night's dinner every time we come to MB. My son (who is now 16) has ordered the "Big Daddy" for the past 4 years and to the server's surprise, finished it each time! The food, service and atmosphere are beyond compare. The Italian buffet cannot be beat. We look forward to returning to our favorite restaurant at MB in a couple weeks!! My family and I eat at Angelo's at least two times when we go to Myrtle Beach. This has been a tradition for almost 20 years and the quality of the food and service has never changed. It's definitely one of our two favorite places to eat when we are there. (The other is Yamato). The food is consistently delicious, service is excellent! The funny thing is that we have always ordered the buffet because we love pasta and all the choices available. I have yet to order a steak but I am sure they are fabulous! I just can't seem to get past the wonderful buffet. We visited angelos simply by chance the first time, but returned 2 nights later for more. The steak and potato meal was the greatest, I ordered the buffet and was highly satisfied- just a little of each was perfect for me. Our waiter, tim, was very accomodating-he explained everything to us first timers there. We had fun with him, and felt special. We have a time share in myrtle beach and will return to angelos on our next trip in august. Hope tim is still there-we loved our time with him. We`re still studying for our "history of angelo`s " test. My wife, daughter and I loved dining at Angelo's. The restaurant was much larger than I expected so we were seated within 3 min of walking in. The salad was fresh and delicious. Ask my 4 yo daughter, she had three plates of salad before dinner. The portions were generous to say the least and quality of the food far exceeded my expectations. I had the Steak Marsala and would drive the 625 miles to have another. Angelo's will be on our short list of restaurants to visit when we go back. Our waitress mentioned they will hand cut a 12oz Fillet that's not on the menu, We were staying in North Myrtle Beach on Cherry Grove and it was definitely worth the time to drive there. We ate at Angelo's one of the first nights of our stay & really enjoyed the food. All of the entrees on the buffet were fresh, hot, delicious. It was worth the money, a good value, especially with children along. We would definitely eat there again! It is what you exspect. The food is good for the money spent. My family and I have been going to Myrtle Beach for over 20 years and Angelo's is always one of our stops. We will return again this year. The service and management are great. The best italian buffett in all of the Myrtle beach area, attention all tourists unless you are allergic to tomatoes you gotta try this place. The filet mignon was great! Ask for the 12 oz, it's not on the menu. Service is excellent! I went to this restaurant based on the reviews I read on this site. I was not disappointed. I had the 14 oz. ribeye and it was excellent. It was as good or better than Ruth Chris. I have put this restaurant on my must visit list when I return to Myrtle Beach. A yearly event for us, this past visit we where there 3 times in a week. Outstanding strip steaks, veaL and chicken dishes. Never had the buffet. In my opinion those who do are either dumb or cheap. The steaks are some of the best I have ever had, and I ain't young. This is the place for steaks! My wife and I have been to Mortons and Ruths Chris, and Angelos is better in taste and value by far!! Please take in consideration this is a family style restaurant when you visit. It's not going to be that stuffy Mortons atmosphere. To the people who wrote bad reviews, if you ask for a replacement on your steak the staff would surely replace it and would be happy to know! We tell everyone to try the steak, it truly is "The Worlds Greatest Steak" We eat their at least twice every vacation. Wish Angelos would open up in my hometown!!!! My family and I heard about Angelo's a few years ago and visited 3 years ago. We have had nothing but an excellent dining experience - with melt in your mouth steaks. We visit Myrtle Beach once a year and when planning what to do - Angelo's is the very first item. As you can see, most ppl who do not give Angelos a good review have settled for the buffet... you do not go to Angelos for a buffet?? You go there for the GREATEST STEAKS IN THE UNIVERSE!! If you do this you will not be disappointed! The buffet is not horrible... but if your in Myrtle Beach, go to a monster seafood buffet if you want endless possiblities! ANGELOS IS AMAZING! I ate there on nov 4th. Not disappointed in the least. Had the 10 oz strip. Excellent. One of the best steaks I ever had. With that you get all the salad and bread sticks and your choice of side. I got the bowl of spaghetti as my side. You get that for $21.00. Not a bad value. Ill go back again..